Ethereum is not meant to be a platform to build esoteric smart contract applications that require a STEM degree to understand, but it aims to be one pillar of a different architecture for applications on the world wide web. With this post we will try to elucidate how this can be done and give some basic examples on how to start building a decentralized app. How can apps run without servers? Currently servers in web apps do much more than what they were originally intended to. Besides serving static web pages, they also keep private information, handle user authentication and deal with all the complicated ways in which data is analyzed and saved. All the user computer does – a device which would be considered a super computer when the web was invented – is to load and display that information to the user. Instead, a more decentralized architecture would allow a much more modular approach, in which different machines and different protocols would handle specific tasks, some on the user’s side and some in specialized machines deployed on a peer to peer network. Therefore all the Data logic (what gets saved, who saves it, how to solve conflicts etc) is handled by smart contracts on the blockchain, static files are served via Swarm and realtime communication over Whisper. The user device keeps the user authentication and runs the application interface. Doing this would remove the danger of data breach and attacks as there are less single nodes keeping tons of unencrypted data, while also removing the load and cost of serving apps by distributing it across the network. Since all those protocols are decentralized, anyone can connect to the network and start providing a specialized service: if the user is browsing from a powerful laptop, for instance, they can also serve static files to network neighbors. A decentralized architecture also encourages innovation: since the interface is detached from the data, anyone can come up with a new interface to the same app, creating a more vibrant and competing ecosystem. Arguably, one of the most interesting and innovative periods in Twitter history was when it served mostly as a central data hub and anyone could build their Twitter Application. If you want to experiment with the app before learning it, we recommend you download Mist and read our introductory tutorial to how to install the app and run it. If you just want to see the whole app instead, you can download it directly from the Stake Voice Github repository. 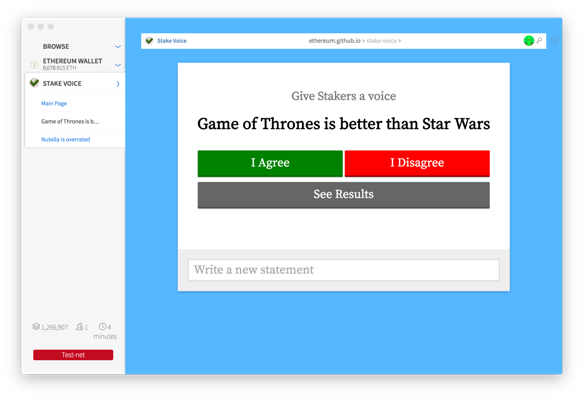 We are going to build a very simple application called “Stake Voice”. The idea is to allow ether stakers to vote on anything they want, and the app will tally the total ether balance of all those who agree or disagree with the statement. The function “vote” will then fire the log, which the application later will count. It also has a check that no ether can be sent accidentally. The “anonymous” function is executed when any ether is deposited on the smart contract and will then automatically reject it. If you want to learn more about coding in Solidity we recommend you start on the ethereum solidity tutorials, read the official documentation page and try it on your browser using the online compiler. That’s essentially it: you choose a hash, choose a side and execute Vote(). So how does this translates into a polling app? So we will use the URL of the app itself to keep the proposal text, and we will use that to display it to the user and generate a hash that can then be used to check the votes. The users can use social media to share which proposals they want to debate or simply use direct links. You checked you are connected to a blockchain, but which one? Is it the main ethereum network? Maybe a testnet or a private network? Maybe it’s a fork in the future and your chain is a brand new one. The best way to check this is to see if the contract address you want to load has any code on it. Furthermore, to execute a contract you need to know two basic things: it’s address and the ABI, which will be a json encoded file containing interface information. Knowing the user’s account reveals a lot of information about the user: how much ether and any other tokens it has on its balance, and their transaction history. So having all apps know this by default would create a super cookie and would be an unacceptable invasion of privacy. On the other hand, requiring the user to create an user account with login information for each site is not only a pain for the user, but also puts your private information in control of third parties, which creates giant honey pots that can be breached by hackers. As a result of this dilemma most users have most of their personal information and authentication information handled by a half dozen billion dollar corporation. Privacy should not be a compromise we accept in exchange of practicality: users should be able to easily authenticate into any app while being in control of their own personal information. Currently, the returning object is an array that holds simple accounts that the user has local access to, but in the future it will also hold smart contract accounts the user uses to identify themselves. This will allow the user to have access to features currently available only to centralized authenticators, like two factor authentication or cloud backup, and to future improvements only available to smart contracts, like allowing a few trusted friends to give you access to an account for which you lost keys or having automatic inheritance of inactive accounts. Each future Ethereum browser will handle how users identify themselves to the App. In Mist we have two ways: either the user can initiate it by clicking the “connect” button (currently it’s just called a “no accounts” button) or the App can request the authentication by calling the “requestAccount” api. Attention: the accounts on this list are just one which the user claims to hold the key to, but the user has provided no proof of doing, therefore you can show a different UI, but don’t send the user any secret information intended only to that account. If you require the user to prove their identity you need them to sign a message, while Mist will also support that in the future, keep it in mind that it would force the user to add an extra step and type their password, so you should only use that when absolutely necessary. We pass the two parameters demanded by the function and then add a third object containing transaction informations, like who is it being sent from and optionally, how much gas to include or how much to pay for the gas. You should only request an account once the user initiated an action: pinging a transaction out of nowhere will deservedly irritate the user and probably make him close your app. If we observe abuses from apps using this feature, we might add more strict requirements to when an alert will show up. The above code will start reading all blocks from number 1.8M (when the contract was uploaded) onwards and then execute the receivedEvent() function once for each event. Whenever a new block arrives with an event this function will be triggered again so you won’t need to call continuously. So what would this function do? So what this function does is that it will use the function web3.eth.getBalance to check the current ether balance of the address that voted. All balances always return numbers in wei, which is a 1/1000000000000000000 of an ether and is not very useful for this particular application, so we also use another included web3 function which converts that to any ether unit we want. In this case we will be using the finney, which is a thousandth of an ether. Then the function will save the balance, along with the position of the voter to a map based on the address. One advantage of using a map instead of an array is that this will automatically overwrite any previous information about that same address, so if someone votes twice, only their last opinion will be kept. Another thing we could do is identify the user and show them if they voted or not. Finally, up to calculating the final tally. We have previously used eth.getBalance in synchronous mode, where the app would wait for the result of the previous action to proceed. Here, since we can be calling a lot of actions every block, we will use it in asynchronous mode: you call the node and execute the action whenever it replies without freezing the interface. As you can follow on the code, what the app is doing is looping in each of the voting addresses and getting their balance, and as soon as it returns, it will either add it to the pro or against camp and sum the totals. A few extra caveats: when there are no events, nothing will be returned and votes won’t be calculated so you should add a timeout function on all functions that rely on events from the blockchain. Now you can feel free to use all your current webdeveloper foo to work whatever magic you want. Use the numbers to build a nice visualization in 3D or connect to your favorite social media to share the best questions. One great thing about ethereum is that you can expand on this simple contract functionality without needing permission: you can add all extra functionality on separate contracts, keeping every single one of them simple and easier to debug. It also means other people can use the contracts you created to their own apps and give new functionality. Meanwhile, all the apps use the same data and backend. You can play with this app live hosted on github pages, but this isn’t the canonical source of truth, just one of the many possible interfaces to it. The same app will also work as a local html file on your computer or on an IPFS network and in the future it will be downloaded directly via Mist using Swarm. Create a listing of currently available statements. Anyone can check them by seeing the sha3 of the proposal text, so you don’t need permission. Instead of (or in addition to) using ether balance, you can use some other ethereum token, like The DAO or Digix Gold to weight your questions differently. Since all that the original contract stores is the sender, you can check all balances. Or maybe you can create your own currency that is based on reputation, karma or some other way.